his house of horologers has a robust collection of timepieces that can withstand the demands of life’s adventures. When one thinks of classic watches, Seiko is one of the names that immediately come to mind. The brand has continuously evolved since its inception in 1881 and has set new benchmarks in pioneering technological innovation, all the while staying true to the organisation’s legacy and illustrious history. After taking Japan by storm, the brand crossed over geographic and cultural boundaries to bring its elegant, durable and top-quality products to the rest of the world. What has ensued is a connection between people over the generations, bound by the joy and inspiration of ‘time’. Seiko takes sport seriously; after all, it first served as the official timer at the 1964 Tokyo Olympic Games. Since then, it has kept accurate time at five Olympiads. Thus, it is but natural for the brand to offer the best time tellers for watch aficionados who challenge their own physical limits on land, in the air or under the sea. For the true masters of horology, the greatest challenge of all is to create watches for those who love adventure sports. The Seiko Prospex collection features timepieces for professional and amateur sportsmen and women. Since making its first diving watch in 1965, Seiko has been exceeding the expectations of those who require wristgear with exacting, professional specifications. From then on, this precise expertise has been at the core of the Prospex range. The line is further categorised into Land, Sea and Air. The watches, made for those who see the earth as their playing field, have a reliable companion with expert knowledge in their Seiko. The intricate machine supports the intrepid traveller or the sporting enthusiast’s journey every step of the way. Prospex for the sky is a formidable device that can let you take control of the heavens with its superior features. Its sleek design makes it apt for commercial pilots and flying enthusiasts. Those seeking thrills under the surface of the oceans greatly benefit from Seiko’s cutting edge technology for timepieces that guide one through the challenges of the deep blue. They have evolved in line with the needs of professional and recreational divers alike. Today, this longstanding tradition and the company’s latest watchmaking expertise come together in this classic 200m water resistant creation. With wide hands and markers, the Lumibrite surface areas are maximised for optimum visibility under water. For enhanced safety, the bezel rotates in just one direction, both the case back and crown are screw-down, and the crown is protected from shock. Dependable, durable and visible – it is the perfect underwater ally. 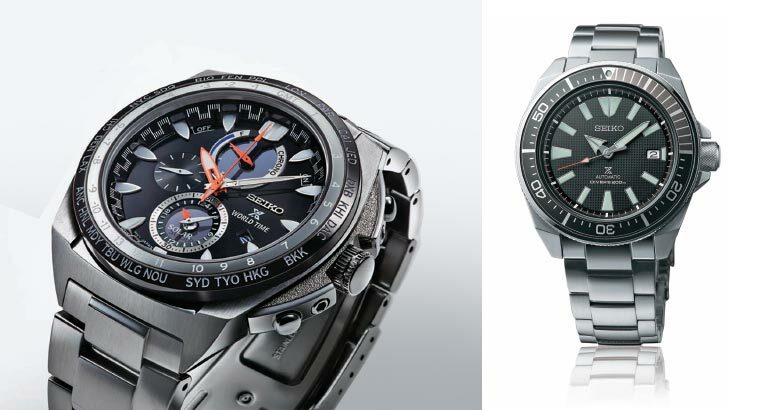 Seiko watches are available at Ambassador Stores in Bahrain.